As a result of recent methodological and theoretical developments in approaches to the human body in archaeological contexts, the theme has recently become a particularly dynamic research area. 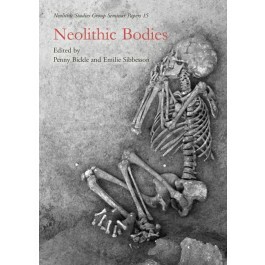 This volume, building on the Neolithic Studies Group conference 2014, captures the variety of debates developing across research into the Neolithic bodies of the Near East and Europe. Papers are divided into three themes; living bodies, the body in death and the representation of the body. In the first section, papers present new research assessing skeletal evidence, alongside new interpretations of the body in the Southern British Neolithic to examine the lived experience of the body in the Neolithic. The second theme illustrates the variety of approaches arising from the study of death and burial, focusing on the many different ways the dead were treated during the Neolithic. The third theme examines the body as it is represented in Neolithic art, through artefacts and the stone stele found in Western and Mediterranean Europe. The volume begins with an introduction to the recent developments in the field and concludes with a discussion chapter from Julian Thomas, which sets an agenda for future studies on this theme. The approaches taken in the papers presented here bridge many different methodologies, ranging from theoretical treatises to methodological debates. Overall, the volume presents the study of the body in the Neolithic as a contested site, at which overlapping research themes meet, and addresses the insights provided by thinking about past bodies. 7. Dismembering bodies and atypical human deposits of the 4th millennium cal BC in the Upper-Rhine valley: Part of sacrificial practices?